Find artworks, auction results, sale prices and pictures of Pasquale Romanelli at auctions worldwide. Pasquale Romanelli ITALIAN ODALISQUE (SULAMITIDE) 1812 - 1887 signed and dated: P. Romanelli / Fece 1871 and the medallions of the headdress inscribed: SU LA MI TI DE white marble, on a verde antico column marble: 109cm., 42 7/8in. column: 97cm., 38 1/4 in. Catalogue Note The Florentine sculptor Pasquale Romanelli achieved an international reputation for his finely carved mythological and biblical marble figures. Romanelli began his training at the Accademia di Belle Arti in Florence under Luigi Pampaloni but was soon taught by the foremost Tuscan neoclassical sculptor, Lorenzo Bartolini. He subsequently became Bartolini\\’s collaborator and, upon the master\\’s death in 1850, the successor of his studio. Romanelli\\’s mythological and allegorical compositions were highly prized by a cosmopolitan clientele, and he exhibited select models in Paris. 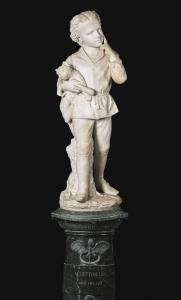 In addition to collectors\\’ marbles, Romanelli executed numerous important commissions for monuments, such as those to Vittorio Fossombroni in Arezzo, Masi in Pavia, and Demidoff in Florence. Romanelli\\’s final tribute to his master, Bartolini\\’s tomb monument, is housed in the Church of Santa Croce in Florence. After Romanelli\\’s death in 1887, his son Raffaello and grandson Romano continued his legacy which lives on to the present day; the Romanelli studio, now a private museum, remains a rare survival in Florence. 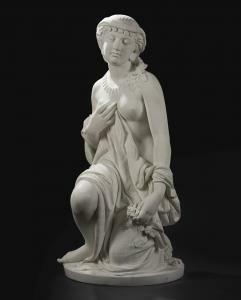 The present marble is a very beautifully executed figure of an Odalisque, a popular type of 19th century Orientalism. An Odalisque is a female slave, a member of a Turkish harem. Particularly detailed and fine carving can be seen in the strands of hair, the folds and pattern of the fabric and the flower held in the proper left hand. The marble epitomises Romanelli\\’s ideas of sculpture. The subject of the marble, Sulamitide, is inspired by the 18th century author Giuseppe Maria Ercolani\\’s play La Sulamitide boschereccia sagra di Neralco - pastore arcade, published in 1732, about a son of the king of Egypt during the time of Solomon. This marble compares closely with one of Romanelli\\’s most famous models of the kneeling figure Ruth. Both the present model and Ruth were later copied by Pasquale\\’s son Raffaello. A version of the Sulamitide by Raffaello, was sold at Sotheby\\’s London on 16 November 2006, lot 44. RELATED LITERATURE V. Vicario, Gli Scultori Italiani dal Neoclassicismo al Liberty, Pomerio, 1994, vol. 2, pp. 897-900 46 Pasquale Romanelli signed and dated: P. Romanelli / Fece 1871 and the medallions of the headdress inscribed: SU LA MI TI DE white marble, on a verde antico column marble: 109cm., 42 7/8in. column: 97cm., 38 1/4 in. figure: 113cm., 44 1/2 in. column: 92cm., 36 1/4 in. among his most celebrated, a fitting choice of inspiration as among Old Testament heroines, Ruth is perhaps the most romanticised. The eponymous character of the Book of Ruth is a Moabitess married to an Israeli husband, whose family has relocated to Moab. Following the deaths of most family members including Ruth\’\’\’\’\’\’\’\’s husband, the widowed young woman bravely decides to depart for Israel with her mother-in-law, Naomi, despite being a foreigner: \“where you go, I will go.\” In Bethlehem, she becomes a hard-working gleaner on a field belonging to Boaz, a distant relative. Boaz so admires Ruth\’\’\’\’\’\’\’\’s sense of duty towards her family that he asks for her hand in marriage, and they have a family of their own. Ruth was a popular subject among 19th-century sculptors active in Italy, notably Giovanni Battista Lombardi and the American Randolph Rogers, whose famous depiction of the gleaning heroine is in The Metropolitan Museum of Art, New York (inv. no. 99.7.1). Romanelli\’\’\’\’\’\’\’\’s model precedes those by Lombardi and Rogers, having been exhibited in Paris in 1851. It is this Ruth who arguably best conveys the character\’\’\’\’\’\’\’\’s piety and modesty. Ruth is believably caught in the act of her physically demanding work. Her romantic relationship with Boaz is hinted at through the longing upwards gaze. The present marble exhibits Romanelli\’\’\’\’\’\’\’\’s attention to detail in the highly realistic carving of the wheat and the beautifully modelled hair and headdress. was sold in these rooms, November 3, 2015, lot 73.
group: 108cm., 42 1/2 in. 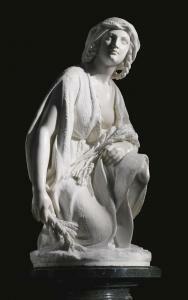 The Florentine sculptor Pasquale Romanelli achieved an international reputation for his finely carved mythological and biblical marble figures. Romanelli began his training at the Accademia di Belle Arti in Florence under Luigi Pampaloni but was soon taught by the foremost Tuscan neoclassical sculptor, Lorenzo Bartolini. Finding Bartolini's favour, he went on to become his collaborator and, upon the master's death in 1850, the successor of his studio. Romanelli\’\’s mythological and allegorical compositions were highly prized by a cosmopolitan clientele, and he exhibited select models in Paris. 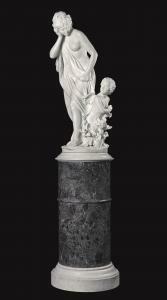 In addition to collectors' marbles, Romanelli executed numerous important commissions for monuments, such as those to Vittorio Fossombroni in Arezzo, Masi in Pavia, and Demidoff in Florence. After Romanelli's death in 1887, his son Raffaello and grandson Romano continued his legacy which lives on to the present day; the Romanelli studio, now a museum, remains a rare survival in Florence. The present marble group is an enchanting example of the Florentine habit of combining classical subjects with the playful sentimentality of genre pieces.